You may already know how my people feel about their "precision writing instruments." Their love for G2 pens runs so deep that they ask for them for Christmas and Diva received not chocolate, but G2s for Valentine's Day this year. I did not think that my band of nerds could get any weirder, but over dinner the other night, I realized they could. Diva mentioned how her friend came into class with a new eraser saying how good it was (our geeky influence is spreading). Diva told the friend that it was her Daddy's favorite kind too. Engineer interrupted her story at this point and asked, "Was it the Pentel white eraser? The one with the blue wrapping?" She affirmed it was. Engineer then said, "Of course your friend likes it! 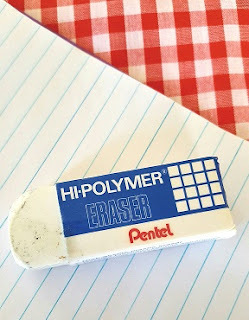 It is the best eraser!" He continued in a definitive tone, "All other erasers shouldn't even be called erasers - they should be called smudgers since that's all they do!" 1-4-3 EM & DM for your finely tuned sensitivity to writing tools.